Due to surgery, any VR gaming I did over the last week was restricted to sitting-down experiences. 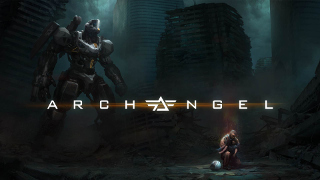 Actually, I didn’t do much VR at all, but I did get the chance to play Archangel by Skydance Interactive, which is available for PC and Playstation VR. Because giant piloted mechas are one of those things VR was built for, IMO. In Archangel, you pilot a 60′ tall giant walking robot of destruction. I didn’t have the stamina to play through the whole thing, but that was due more to surgery than VR sickness. It doesn’t seem to be a long game, though there are several difficulty levels and a number of missions to play through. The game is made with the Unreal Engine, so it naturally emphasizes greater photo-realism. And, of course, flashy effects. The game is effectively a “rail shooter” from the arcade days. You have little control over where or when you move, but you must instead focus on fighting what you find as you and your support ships progress through the level. You control rechargeable weapons that can be fired independently from each hand – rockets from one, guns from the other. You can also create limited duration force-field shields from each arm, which you can hold up to protect yourself from attacks. And best of all, in some cases, you can punch enemies and structures. This is the kind of game I would have happily shoved quarters into back in the day (probably at $0.50 or $0.75 per play), even without the VR aspect. The VR makes it oh-so-much-cooler. Of course, this isn’t back in the day. We live in a world where you can buy a bundle of arcade-like games for a buck. And this is a fairly full-priced indie game at $30 (I got it on sale over Christmas for I think $10 off). But… we’re also in the early days of VR, and I’m still not yet jaded. The graphics are really good for a VR game. Not up to Fallout 4 VR or Doom VFR levels (but then Fallout 4 VR has its own graphics anomalies), but definitely decent for a small/mid-sized studio production. They’ve spent a bit of effort adding a storyline and interesting characters. The voice-over work is decent. You have the ability to upgrade the Archangel’s systems between missions, based upon your own preferences. So yeah, in many ways it’s much better than the old arcade rail-shooters even without considering virtual reality. And that’s plenty to do. Blocking and shooting keeps you busy. You feel like you are (mostly) controlling a giant mecha. They got the sense of scale right. In spite of having no control over the Archangel’s movement, things move smoothly enough and (relatively) slowly enough, and your virtual cockpit gives you enough of a presence that sickness wasn’t really an issue. While rails-shooter isn’t my go-to gaming experience most of the time, the quality is high and I do like having another VR game I can play from my chair. However, for a “mecha-piloting” experience, until the new VR-enabled version of Mechwarrior 5 Mercenaries comes out (a year from now), the little demo game “War Robots VR: The Skirmish” comes much closer to scratching my itch. But it only lasts five minutes.